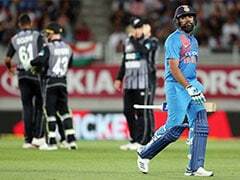 Highlights: India vs New Zealand 2nd T20I: India beat New Zealand by seven wickets to level the three-match series. Highlights Between India vs New Zealand 2nd T20I, from Auckland. 14:52 IST: That brings an end to the second T20I between India and New Zealand. Thank you for joining us for the live coverage. 14:47 IST: FOUR! Rishabh Pant scores the winning runs as India beat New Zealand by seven wickets to level the three-match T20I series 1-1. The visitors chased down the 159-run target with seven balls to spare. Pant remains unbeaten on 40 with MS Dhoni not out on 20. 14:44 IST: End of the over! India are 156/3 in 18 overs, need just three more runs to win. 14:38 IST: SIX! Rishabh Pant delights the Auckland crowd with a one-hand six. India need 15 runs from 21 balls. 14:35 IST: End of the over! Six runs from the last over by Ish Sodhi. India are 135 for three in 16 overs, need 24 runs to win. 14:32 IST: In the air... But Rishabh Pant is safe. Ish Sodhi bowls an enticing delivery that takes a top-edge off Pant's willow and Ross Taylor fails to grab a stunning catch. 14:28 IST: FOUR! MS Dhoni gets off to the mark with a boundary. He deflects the delivery by Tim Southee with his gloves to the fine leg for four. 14:27 IST: FOUR! Rishabh Pant flicks it down the leg side to get some quick runs for the team. 14:26 IST: MS Dhoni comes to bat at number five. 14:25 IST: WICKET! Vijay Shankar departs for 14. India are three down now. He looked in great shape out there. 14:23 IST: SIX! What a shot. Vijay Shankar lifts up the full-toss delivery over long off for maximum. 14:21 IST: FOUR! It takes India to 111/2 in 13.1 overs. 14:20 IST: FOUR! Vijay Shankar defeats New Zealand skipper Kane Williamson on the field. 14:17 IST: 100 up for India in 12.3 overs. Rishabh Pant pulls it away in front of square leg to take a quick single. 14:13 IST: FOUR! Perfectly-timed shot by Rishabh Pant. He gets on his knees and lofts it up over mid-off to get a boundary. 14:10 IST: Vijay Shankar comes to the crease. 14:08 IST: WICKET! Lockie Ferguson removes Shikhar Dhawan for 30. India have lost both their openers, with 71 runs to chase. Ferguson defeats Shikhar Dhawan with a pacy short-pitched delivery. It takes an top-edge off Dhawan's willow and Colin de Grandhomme takes an easy catch. 14:04 IST: 10 overs gone! A wicket and six runs from the over by Ish Sodhi. India are 82/1 with Shikhar Dhawan and Rishabh Pant on the crease. 14:01 IST: Rishabh Pant comes to bat at number three. Two left-handers are on the crease now. 13:59 IST: WICKET! Huge wicket for India. Ish Sodhi strikes to get Rohit Sharma after fifty. That brings an end to the 79-run stand between the Indian openers. 13:57 IST: FIFTY for Rohit Sharma! Skipper Rohit Sharma scores his 16th half-century. He smashed three boundaries and four sixes to reach the 50-run mark. 13:55 IST: SIX! That's massive. Mitchell Santner bowls too wide and Rohit Sharma picks it up for maximum with sheer elegance. 13:51 IST: SIX! Rohit Sharma overtakes New Zealand's Martin Guptill to become the leading run-scorer in T20 International cricket. He is batting on 39 and has led India to 62/0 in 7.2 overs. He Rohit now has 2,277 runs to his name. 13:46 IST: 50 up for India in six overs. Indian openers have given the team a confident start in the chase of 159 runs. 13:43 IST: FOUR! Well-timed shot. Rohit Sharma slices it over the point to get a boundary. 13:39 IST: FOUR! Even better from Shikhar Dhawan. He pulls this one, a shortish delivery, through the mid-wicket for a boundary. 13:38 IST: FOUR! Shikhar Dhawan joins the party. He smashes a leg-cutter by Tim Southee to long on for a boundary. 13:36 IST: SIX! Rohit Sharma lifts is up over the fine leg for maximum, takes India to 31/0 in 3.4 overs. 13:34 IST: FOUR! Rohit Sharma smashes it down the ground for a boundary. 13:31 IST: In the air... but Shikhar Dhawan is safe. Lockie Ferguson attacks the Indian opener with a short ball and almost traps him. He plays an uncontrolled pull shot but gets two runs for the team. 13:28 IST: SIX! 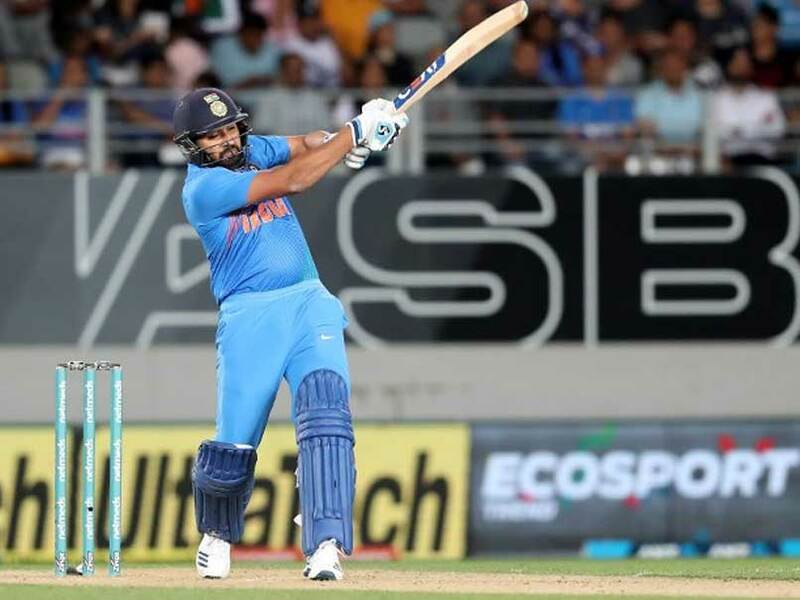 Rohit Sharma stays fine and still on the crease and swings the bat perfectly to guide the ball accross the fence over deep mid-wicket for maximum. 13:27 IST: A good start for Scott Kuggeleijn. He concedes just four runs in his first over. India are 10 without loss after first two overs. 13:24 IST: Scott Kuggeleijn to bowl from the other end. 13:23 IST: End of the over! India are six without loss after the first over. 13:20 IST: FOUR! India get off to the mark with a boundary by skipper Rohit Sharma. 13:19 IST: Rohit Sharma and Shikhar Dhawan are out in the middle to start India's chase of 159 runs. Tim Southee to open the attack for New Zealand. 13:09 IST: WICKET! Khaleel Ahmed claims his second wicket. New Zealand score 158/8 in 20 overs. Colin de Grandhomme top-scored for New Zealand with 50 runs, while Krunal Pandya claimed three wickets for India. 13:07 IST: Tim Southee comes to the crease. 13:06 IST: WICKET! Inside edge and Mitchell Santner is gone for seven runs. First wicket for Khaleel Ahmed in the final over. 13:04 IST: Scott Kuggeleijn comes to the crease. 13:03 IST: WICKET! Ross Taylor run out for 42. Rohit Sharma's direct hit does its magic. New Zealand are 153/6 in 19 overs. 13:01 IST: Wide. 150 up for New Zealand. Bhuvneshwar Kumar has conceded five runs in the over so far. 12:58 IST: A crucial 1 run. Ross Taylor takes a quick single to keep the strike. New Zealand are 145/5 with two overs to go. 12:54 IST: FOUR! Superb timing. Ross Taylor flicks away the yorker ball comfortably to the deep mid-wicket for a boundary. A few minutes ago, he was being check by the team physio. 12:53 IST: End of the over! Bhuvneshwar Kumar concedes just seven runs in the 17th over. New Zealand are 136/5 with Ross Taylor (31*) in charge. 12:47 IST: Mitchell Santner comes to the crease. 12:46 IST: WICKET! Colin de Grandhomme departs after fifty. Hardik Pandya claims the much-needed wicket for India. That brings an end to the 77-run stand between De Grandhomme and Ross Taylor. After breaking the crucial partnership, India will look to tighten the noose on New Zealand in last four overs. 12:44 IST: FIFTY! Colin de Grandhomme scores maiden T20I half-century off 27 balls. He smashed a boundary and four sixes to reach the 50-run mark. New Zealand are 127/4 in 15.3 overs. 12:39 IST: FOUR! Clever shot. Ross Taylor sweeps the half-volley to the fine leg for a boundary. It takes New Zealand to 119/4 in 14.4 overs. 12:36 IST: Khaleel Ahmed comes back into the attack. 12:35 IST: End of the over! Colin de Grandhomme eyes his maiden T20I fifty, helping New Zealand reach 114/4 in 14 overs. 12:30 IST: Hardik Pandya comes back into the attack. 12:28 IST: FOUR! 100 up for New Zealand and 50-run partnership comes up between Colin de Grandhomme and Ross Taylor. 12:24 IST: SIX! Exquisite. Colin de Grandhomme in on fire now. The back-to-back sixes take New Zealand to 93/4 in 11:3 overs. 12:23 IST: SIX! Wow! That's massive. Colin de Grandhomme shows off his strength with that shot. yuzvendra Chahal has already conceded 16 runs in the first three balls of the over. 12:21 IST: SIX! Colin de Grandhomme lifts another one over the long off for maximum. 12:20 IST: FOUR! Colin de Grandhomme smashes it to deep backward point for a boundary. 12:19 IST: SIX! Straight like an arrow. Colin de Grandhomme is stretching his muscles a bit to give home team some relief after early wickets. 12:18 IST: End of the third over by Krunal Pandya. He concedes just four runs. New Zealand are 60/4 in 10 overs. 12:12 IST: Colin de Grandhomme comes to the crease. 12:10 IST: WICKET! Krunal Pandya claims his third wicket. Huge wicket for India. New Zealand skipper departs for 20 runs. New Zealand are 50/4 in 7.5 overs. 12:05 IST: Yuzvendra Chahal to bowl from the other end. 12:04 IST: Ross Taylor comes to the crease. 12:03 IST: It was a controversial decision by the umpire as the HotSpot showed an inside edge. Unluckily, New Zealand have lost their three batsmen and a review too in first six overs. 12:00 IST: WICKET! New Zealand lose their third wickets as Daryl Mitchell departs for 1 run. That brings an end to a highly successful first over by Krunal Pandya. He claimed two wickets and conceded just three runs in it. New Zealand are 43/3 in six overs. 11:57 IST: Daryl Mitchell comes to the crease. 11:56 IST: WICKET! Krunal Pandya strikes in his first over. Colin Munro departs for 12 runs as Rohit Sharma takes an impressive catch. 11:55 IST: FOUR! Excellent use of feet by Kane Williamson. He plays a beautiful on drive to get his second boundary of the over. 11:52 IST: FOUR! Kane Williamson plays a cut shot and the ball goes past the wicket-keeper for a cheeky boundary. 11:51 IST: Hardik Pandya comes into the attack. 11:50 IST: FOUR! Well placed shot by Kane Williamson. He pushes the ball gently to deep backward point to get a boundary. 11:48 IST: SIX! A six from the moment he hit it. The classy shot from Colin Munro gets him some quick runs and takes New Zealand to 25/1 in 3.4 overs. 11:45 IST: Kane Williamson comes to the crease. 11:43 IST: WICKET! Bhuvneshwar Kumar strikes after conceding a boundary and a six. Tim Seifert departs for 12. The dangerous wicketkeeper-batsman had scored 84 runs in New Zealand's 80-run win over India in Wellington. 11:42 IST: SIX! Tim Seifert crunches it to the long on for a six. It takes New Zealand to 15/0 in 2.2 overs. 11:41 IST: FOUR! Tim Seifert advances and pulls away the good length ball away to the leg side to get his first boundary. 11:40 IST: Another good over for India. Khaleel Ahmed concedes just two runs. New Zealand are five without loss in 2 overs. 11:36 IST: Khaleel Ahmed to bowl from the other end. 11:35 IST: End of the first over! A good start for Bhuvneshwar Kumar. New Zealand are three without loss after the first over. 11:30 IST: Time Seifert and Colin Munro are out in the middle to start New Zealand's proceedings. Bhuvneshwar Kumar to open the attack for India. 11:18 IST: "I know we lost the last game, but chasing has been our strength. We have spoken about what we need to do with bat and ball. Hopefully we can get a win today," Rohit Sharma says at the toss. 11:10 IST: "Usually a good batting surface here. It's always a great opportunity to play against India," Kane Williamson says after winning the toss. 11:02 IST: TOSS! 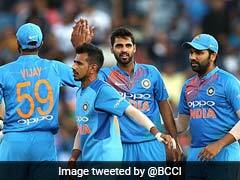 New Zealand win toss, opt to bat against India in Auckland. Both the teams are unchanged for the second T20I. 10:57 IST: The hosts are already 1-0 up in the three-match T20I series, thanks to an emphatic 80-run win in the series opener on Wednesday. 10:49 IST: Uncapped fast bowler Blair Tickner has joined the New Zealand squad for the second T20I. New Zealand Women win a last-ball thriller at Eden Park! SERIES VICTORY! @hmrowey makes it through for the winning run off the final ball and we take the series 2-0 with a match to play! What a finish! 10:38 IST: Ahead of the start of the men's clash, India women's cricket team suffered a four-wicket defeat and lost the three-match T20I series to New Zealand women 0-2 with a match to go. 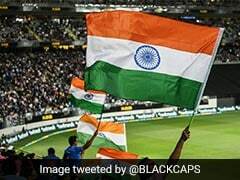 10:30 IST: Hello and welcome to our live coverage of the second T20 International between India and New Zealand at the Eden Park. 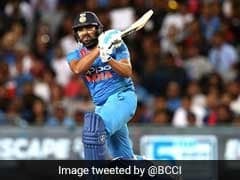 Rohit Sharma would like to lead from the front after scoring just one run on Wednesday and a significant contribution will also be expected from Rishabh Pant, who is in the running for a World Cup berth. He could not do much in Wellington, getting four off 9 balls before spinner Mitchell Santner bowled him with a fast yorker.